Published on March 13, 2010 in COP, corruption, Finance, General T&T, Law, Media, Parliament, PNM, Politics, UDeCOTT and UNC. 7 Comments Tags: Calder Hart, Kamla Persad-Bissessar, Keith Rowley, Patrick Manning, Robert Lindquist, T&T Govt, UDeCOTT. FOR THE first time, Prime Minister Patrick Manning yesterday admitted that former Udecott executive chairman Calder Hart has “a case to answer”, even as fresh questions emerged over the role Manning played in the circumstances surrounding Hart’s departure from Trinidad last Saturday in the midst of an ongoing criminal investigation. Minutes after saying former executive chairman of the Urban Development Corporation (Udecott) Calder Hart was not guilty of anything, Prime Minister Patrick Manning announced the appointment of Chief Executive Officer at the Housing Development Corporation, Jearlean John as the new chairman of Udecott, replacing Hart, who resigned last week. Yesterday the Prime Minister’s answers focussed on the principle that a person is innocent until proven guilty. We agree but in order to prove innocence or guilt, investigations have to be undertaken and indeed both sides of any allegation have to be heard. But can we really believe that the allegations raised against Calder Hart were being seriously investigated by the Government before the Congress of the People passed to the media documents they had obtained from Malaysia? Managing director of the Housing Development Corporation Jearlean John is up for the challenge of heading the board of the Urban Development Corporation (Udecott) and said her new post as chairman is “just an additional duty.” She also had praise for her predecessor Calder Hart whom she said “did some good work”. Rowley explained that Prime Minister Patrick Manning’s candidate to replace Calder Hart for the position of Urban Development Corporation of Trinidad and Tobago (Udecott) chairman, Jearlean John, held a significant position in the Piarco Airport corruption scandal that hit the former United National Congress (UNC) government. Told that the public believed former minister Dr Keith Rowley was on the way to total exoneration, Manning was unyielding. ‘Well, if that is the view of the public, that is the public’s view. Let’s see. I have said before. One has to await the evening in order to determine how splendid the day has been. It is not evening yet. Thank you, ladies and gentlemen,’ he said, bringing an end to the news conference. A former government minister is under investigation for failing to declare several bank accounts to the Integrity Commission for the year 2007, in accordance with the Integrity in Public Life Act, 2000. ‘I have no foreign bank account. My wife has no foreign bank account.’ ‘Again I say, I have no account in Caymans! I never had, and I do not now have!’ Rowley last evening slammed what he described as ‘another desperate’ attempt’ to slander his name in the face of what has been deemed to be his apparent exoneration in the Calder Hart affair. Diego Martin West MP Dr Keith Rowley says it is clear that Prime Minister Patrick Manning “has not given up in his expectation that he” would “eventually succeed in damaging” Rowley. “The Prime Minister has sent to that Commission of Enquiry (investigating Udecott and the local construction sector) two revisions in terms of reference to (the housing projects at) Cleaver Heights, that cost millions of dollars to pursue…We have not had the outcome of that yet,” Rowley said. “So clearly he (Manning) is expecting that something will come of that. He is expecting that something will come of it…He has not given up on what his original intention was,” he said. Rowley said yesterday afternoon that he believed that Manning held hope that evidence would appear in the short term to tarnish Rowley. PNM Diego Martin West MP Dr Keith Rowley yesterday condemned Prime Minister Patrick Manning for hinting that he may be “in jeopardy” with respect to the Cleaver Heights housing project when the Uff Commission of Inquiry submits its report. In a final attempt to convince the Uff Commission of Enquiry that its operations were above board, the Urban Development Corporation of Trinidad and Tobago (Udecott) insists that the attacks on the company were political in nature. Opposition Leader Kamla Persad-Bissessar said yesterday that the Prime Minister should disclose to the nation the contents of the private conversation he held with former UDeCOTT chairman, Calder Hart. Opposition Leader Kamla Persad-Bissessar has raised concerns about the conversation that Prime Minister Patrick Manning engaged Calder Hart in before Hart resigned from the Urban Development Corporation of Trinidad and Tobago (Udecott). 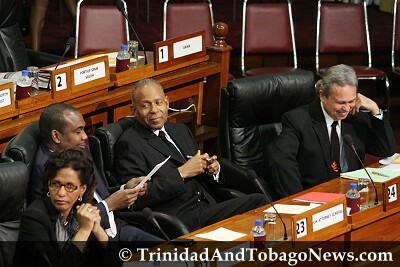 Prime Minister Patrick Manning has covered up for UDeCOTT’s executive chairman Calder Hart, Tabaquite MP Ramesh Lawrence Maharaj claimed yesterday. Police yesterday spent close to two and a half hours interviewing Carl Khan, the ex-husband of Sherrine Hart, wife of former Udecott chairman Calder Hart at the law offices of Timothy Hamel-Smith at the corner of Albion and Dere Streets, Port-of-Spain. Prime Minister Patrick Manning’s statement to the media yesterday about a probe into the affairs of former Udecott chairman Calder Hart caused a stir among several lawyers yesterday. Any motion of no confidence from a PNM constituency against the party’s leader will be dealt within the bounds of the PNM’s rules and Constitution, PNM chairman Conrad Enill said yesterday. STATEMENTS made by Independent Senator Michael Annisette during the tea-break in the Senate on Tuesday in defence of former Udecott chairman Calder Hart at the expense of Customs officials, were described as “shocking” and “unnecessary” by Public Services Association (PSA) president Watson Duke. Works Minister Colm Imbert yesterday charged that the Opposition, in particular Dr Tim Gopeesingh, does not have the moral authority to criticise the Government on corruption and improper procurement practices. Notwithstanding the allegations against UDeCOTT and its former chairman, Prime Minister Patrick Manning said yesterday that Government is committed to bringing a new order in the construction sector. In a statement under “personal explanations” in the Lower House, Manning corrected the figures he had previously given during his “religious persecution” speech a fortnight ago. TABAQUITE MP Ramesh Lawrence Maharaj yesterday said Prime Minister Patrick Manning could not cite the cases of former Chief Justice Satnarine Sharma and former government ministers Franklin Khan and Eric Williams to explain why Calder Hart resigned as Udecott chairman or Government’s investigation into the State-owned company. So,having spent all that money on the UFf inquiry, and having tried to derail Dr. Rowleys political career by false accusations, and having ignored Mrs.Hart’s first husband’s testimony, we discover voila! that Hart has a case to answer, after he has fled the country. Will interpol be asked to bring him back? Is there an international warrant issued for his arrest? or is this another smelly political red herring. The Airport Inquiry has cost almost as much as that airport of mismatched tile and overflowing sewage( not to mention 200 dump trucks disappearing from the Min.of Works list under Carlos John’s tenure. Tell you what, I think we keep the lawyers at bay, and off the government in power’s backs by these lengthy trials that go nowhere, make lots of people even richer that they were, and import a lot of foreign lawyers to grandstand and gallery in front of our people. Why not try him in the people’s court, in Woodford Square?Its sufficiently close to he halls of justice for lawyers wishing to give technical advice to be summoned. Have him tried by a jury of five unemployed youth from LAventille, five unemployed youth from Chaguanas./Caripicjhiama, and two others, one from Sando and one from Arima. Let a panel of UWI law students (three) be the judges. Use this as a moot court, but let the verdict be real. the UWI judges would get academic credit in place of fees, and the jurors would get a small daily allowance for transport and meals. It would not matter how they dressed, because they are poor and unemployed. Let an international panel of jurists come to observe, but at their own costs.All the other rules of court should apply. Police should be around to be sure that the crowd does not get unruly, throw things or be disruptive. The bandstand would be the bench and seats for jurors, as well as the docks. Traffic around the square should be restricted during the hours of the trial, say 9.00 to 2.00 daily, without a break. It is these young people whose future greedy rascals like Hart, Ish, Panday and John try to ruin. They should be answerable to the people.Party affiliation of the young jurors should be stated to be sure we had balance. If it turns out that th Prime Minister was knowingly defending a crook, try him there, for corruption, by the same type of judge and jury. This would be a revolution! The President has the power to order it to be so,in consultation with the Chief Justice and the Minister of Legal Affairs. For too long, we have treated our young people as fools. We could awaken their national concern by this type of trial. If found guilty, notice I did not say when, fines large enough to recoup all he made in TnT should be levied. I had previously recomended looking for his assets. Those assets here and abroad, should be siezed. Carl Khan, the ex-husband of Sherrine Hart, who is the wife of former Udecott chairman Calder Hart yesterday signed a one-and-a-half page statement giving credibility to his disclosure that Sherrine’s brother and brother-in-law are two directors of Sunway Caribbean Construction Limited. On the front page: From the moment Diego Martin West MP Dr Keith Rowley was fired on April 23, 2008, Udecott and the affairs of its then executive chairman Calder Hart took centre stage. We are so good at closing the barn door after the horse has run off! Then we wring our hands in despair. We should go after those who helped him get away so easily. Dr. Rowley-sic em! Carl Khan, the ex-husband of Sherrine Hart, who is the wife of former Udecott chairman Calder Hart yesterday signed a one-and-a-half page statement giving credibility to his disclosure that Sherrine’s brother and brother-in-law are two directors of Sunway Caribbean Construction Limited”. This shows the stupidity and incompetence of the Police of T&T. Why is it necessary for Carl Khan to sign such a statement if the Police already has proof that there is a connection? The statement of an ex-husband is therefore irrelevant. What matters is the legal proof that there is a connection between Hart and his relatives.This legal proof should come from the sources representing the government of Malaysia. The love of a “jilted lover”(as stated by Manning) should have nothing to do with it. AS THE criminal probe into the Urban Development Corporation of Trinidad and Tobago (UDeCOTT) and its former executive chairman, Calder Hart, continued yesterday, the Anti-Corruption Investigation Bureau (ACIB) seized several more boxes of documents from the office of chartered accountant David Montgomery. For a second day, officers of the Anti-Corruption and Investigations Bureau (ACIB) raided Sunway and David Montgomery and Chartered Accountants as they stepped up their criminal probe into the Urban Development Corporation (Udecott). Officers of the Anti-Corruption Bureau visited the Central Bank in Port of Spain and seized documents relating to insurance bonds connected to the Urban Development Corporation of Trinidad and Tobago Ltd (UDeCOTT). The Central Bank has categorically denied reports published in both the Newsday and Express newspapers yesterday that police officers had visited the institution, interviewed its officers and seized documents relating to a performance bond issued by a company for a Udecott project. Having resigned and taken sudden flight from Trinidad on March 7, Newsday yesterday reported that the police do not know the whereabouts of Hart, who is reportedly not answering any of his telephone numbers. Sherrine Hart, wife of former Urban Development Corporation of Trinidad and Tobago (UDeCOTT) executive chairman Calder Hart, yesterday defended herself through her lawyer following a press conference held by the Congress of the People (COP). At 5.45 p.m. yesterday, however, attorney Kamini Persaud wrote the Express on behalf of Hart denying the charge made by De Lima. The letter from Attorney Persaud did not address the controversial issue of the family link. The police are reportedly reviewing documents submitted to them by Carl Khan, the ex-husband of Mrs Sherrine Hart, the Malaysian-born wife of former Udecott executive chairman Calder Hart. Officers of the Anti-Corruption Investigations Bureau (ACIB) maintained yesterday that despite repeated attempts, they have been unable to contact former Udecott executive chairman Calder Hart at the two telephone numbers given to them after he fled the country on March 6.